I wanted to show you another card I made today using the retiring set Baroque Motifs. This set is so versatile and lovely, it's hard to imagine anyone NOT owning it. This beautiful card is very simple to make. The images on the black background were stamped in VersaMark ink and coated in clear embossing powder, then set with the heat too. I then tore the corner and place a piece of our First Edition DSP behind it; affixing the whole thing to a crumb cake card. 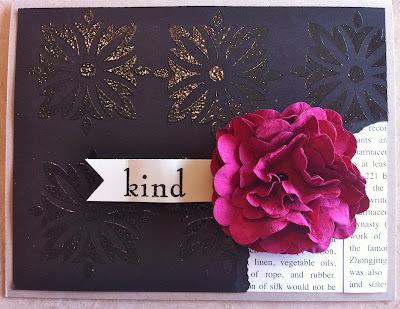 The "kind" is them stamped on a 1/2" strip of very vanilla card stock and the flower is made from 2 large scallop and 1 small scallop punch outs in rose red card stock. To get that multi-layered look to the flower, I used a technique taught to me by fellow demonstrator, Christine Logan. I crumpled the card stock until it looked like the edges were starting to peel and then I gently, carefully, pulled them apart; turning 1 flower into 2! I pierced the centre with our paper piercing tool and put a black brad through to hold them together. I then affixed the flower to the card using glue dots and voila! Once beautiful Baroque Motifs card that can be used for almost any occasion! So pretty!! One of my favorite sets too. I'm a sucker for heat embossing - so elegant!